My easy recipe for Tzatziki sauce made with Greek yogurt, cucumbers and garlic. I add this to souvlakis, gyros or grilled pita chips! 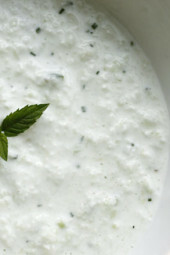 Tzatziki is a classic Greek cucumber yogurt sauce or dip. It is served as a condiment over gyros, fish, souvlakis, and other Greek dishes. I personally love it on my Spinach and Feta Stuffed Chicken Breasts, on Greek Turkey Meatballs, Mediterranean Chicken Kebab Salad, grilled chicken burgers, as a dip with crudites and even drizzled over Greek salad. 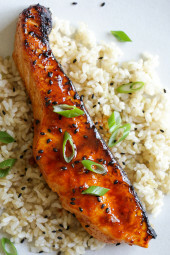 My lightened up version just as delicious as the full-fat version! Chives aren’t typically added but I love the flavor it adds to it. I also love it with fresh mint leaves. Straining the yogurt and cucumbers are a must to make this thick, so don’t skip this step! or a coffee filter for a few hours to remove as much liquid as possible. Set aside. and sprinkle with a little salt (this helps release the liquid). You may want to use the back of a spoon to help squeeze out any excess liquid. Combine strained cucumber, garlic, yogurt, salt, pepper, lemon juice, dill, chives and refrigerate at least 1 hour before serving. Makes about 2 cups. Store in refrigerator for about a week. I don’t know what happened. I used paper towels to squeeze out cucumber, I spread out the yogurt on paper towels and changed it a few times. It was to thick. I couldnt blend it together by hand. I like it smooth and my blender of 30 years must be ready for the trash because it wouldn’t blend. I added more lemon juice, added milk, sitrred and finally added to my mini food processor. Happy ending. It tasted great even if it was torture. Blender is hitting the street. I added a teaspoon or so of feta and served with your turkey meatballs (which I added dill to also). Thank you. Can Icelandic-style yogurt be used instead of Greek yogurt? I buy Siggis Non-fat yogurt and I like it better, because it’s thicker. I have used Trader Joe’s zero fat greek yogurt, and it works very well. Excellent recipe! Can the chicken be baked? Or cooked on stove top? This tzatziki sauce is very good! It’s perfect for Mediterranean bowls are just as a veggie dip. My husband loves this too! I love that this is zero freestyle points now. By the way, Gina, I found Skinnytaste in 2016 when I rejoined WW for the “last” time. Your cookbooks are used every week. My husband has loved every Skinnytaste recipe I have made. Now when I tell him we are trying a new recipe, he always asks if it’s from you. When it’s time to meal plan for the week, I’ll hand him your cookbooks and he picks out a few things. And of course, your weekly meal plans are very helpful. Thanks to you and WW, I am a Lifetime member for over a year! I appreciate all the passion and energy you put into Skinnytaste! I don’t know what I’d do without it! That warms my heart! I’m so happy to hear that, thank you so much Maggie! Love it! and think it is 0 points! Served with Chicken Shawarma Salad Kebab. Fresh mint is so delicious in this instead of dill. As a Greek girl – I use about a tablespoon of fresh mint. Hi Gina. I discovered your site through WW. Can’t wait to try more of your recipes. I tried this one and we definitely liked it. 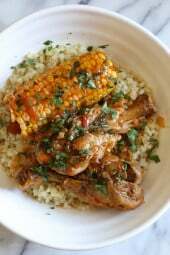 I live in a small town in Quebec and don’t have access to some ingredients for certain recipes. I do my best to adapt. I can’t get the yogurt that you suggested, and bought the Presidents Choice brand. We found the overall flavour of the tzatziki delicious, but it was a bit sour/bitter. Do you have any suggestions that would alleviate the bitterness? I think having a great tasting yogurt is key. I have a question- did you drain the yogurt out on the counter or continue to refrigerate it? I had this question myself. After some googling, I read the yogurt should be drained in the refrigerator. Just place your mesh strainer with the yogurt in it over a bowl and stick it in the fridge. I hope this helped! Do you think this would freeze well? I have a bunch of cucumbers I need to use up. I'm just thinking that maybe I can make a huge batch and freeze a bunch for later use. This was perfect. It took care of my tzatziki craving that I've had for weeks! Thanks for posting!! We can add chili powder to the Tzatziki sauce for a little kick! I didnt have any fresh dill pickles, so I used tarragon. I did not like the flavor as much, next time i will make sure to use dill!!! This is fabulous! I used it in Greek turkey pitas. SO good! I had been buying this pre-maid at Sam's Club for $5.99, and about $10 worth of gas to get there! I made this last night and I can't even tell you how much I LOVE it!! I don't think I will ever purchase it again! Can i use dry herbs and just pinch them in??? I just ran across this and plan to make it soon. Thanks! In the meantime, just to let everyone know…..Costco has a wonderful tzatziki sauce, but it comes in a large container and may be too much for some people. I was surprised at how good the nutritional info was though….it's not bad at all, so I've been using it as a dip for my raw veggies. Thanks so much for the recipe! Gina, how long do you think this would last in the fridge? Me too! I came to the comments to see if anyone made without! I just found your recipe via Pinterest. It was great! We had it with homemade lamb gyros (lol, it sounds like I made the lamb, instead of just using it to make gyros…anyway…), and it was cool and tangy and perfect. I also used the Fage fat-free Greek yogurt, and my husband didn't believe it was low-fat! And your tip about draining the pureed cucumber before adding it really kept the thick creamy texture of the yogurt. Thanks! is there nany stores that sell this sauce? I am trying to make this now, but how can one small cucumber make 1 cup grated and drained? My LARGE cucumber has got me about 2 tbsp..
making this with your turkey meatballs, homemade pita and tabbouleh for a delicious dinner tonight! Delicious! I was worried because a) I have high standards for tzatziki and b) I've never made a condiment more complicated than "mix olive oil with balsamic vinegar", but this recipe was simple and tasted amazing. I had it with greek rice and steamed broccoli. Bookmarked and I'll definitely make this again. I made this tonight and served it with chicken tenders marinated in a no fat Greek salad dressing. Sauteed them and served with chopped tomatoes, spring onions and cucumbers. It was delish! A souvlaki minus the pita wrap! YUMM! Try this with the baked zucchini sticks. delish! Made the skinny tzatziki sauce along with the greek turkey meatballs…YUM Used dried chives and left out the dill. It was still delicious. Best tzatsiki I've ever made! Drizzled a bit over a side salad, too. I made this up when I made up the Greek Turkey Meatballs and it was amazing. I did note that the small cucumber was not nearly enough to meet the 1 cup that the recipe calls for. Thankfully when I went shopping I picked up another for the salad and ended up using it to help complete the sauce. Also, my hubby- who is a Greek Food fanatic noted that it needed more lemon juice as well. Overall though a great recipe that will be made many more times in this household! Gina, I used this recipe as a base and added to it for our family's taste. I shred the cucumber with a potato peeler first, add the yogurt, a splash of EVOO, white whine vinegar, 2 cloves of garlic, lots of dill (I omit the chives), salt, pepper and just a titch of Splenda. Then I add 1/4 cup reduced fat sour cream and place it in the fridge for awhile. The recipe builder gives it 2 points for 6 servings and 1 point for 8 servings…I make this all the time and love it! Due to a miscommunication, I had to make this with lowfat regular yogurt instead of fat free greek yogurt. Thankfully I calculated it out & it was still 0 points (technically 1/2 a point). This was delicious! – we served it with your Persian Kebabs & it was perfect – I even got to use my fresh herbs from my garden for the first time – yippee! Thanks! Yes but an 1/8 of a cup is 0 points, and the serving is for 8 so it only uses an 1/8 cup of yogurt per serving. If you put the whole recipe in recipe builder you would have seen this. This looks amazing! I love Tzatziki! However, is it really 0 points? I looked up nonfat greek yogurt in the book and it says 1 cup is 3 points? I'm confused! I make what I call Greek Taco's and make a tzatziki identical to this to top them. I use ground turkey breast, fat free feta cheese ( which tastes just like the full fat feta) and grilled veggies in the taco's. 2 of them is less than 400 calories and less than 5 grams of fat! Steamed corn tortilla's of course. Yummo! I made this a couple of days ago for a greek salad dinner last night. I didn't drain the greek yogurt (because I didn't have time to be patient) and used the blender attachment for the food processor to whirl everything together into a smoother, more fluid salad dressing. It's delicious as a dressing, and I'll definitely use make it again! Made this today and it was awesome!! First I put some on the inside of a pita pocket the salad and tuna fish…delish! Then for dinner, I spread a thin layer over my piece of baked tilapia! Thanks for another great dish! Thanks Steph, I'm happy your picky roommates approved! I'm happy you all enjoyed it, nothing beats homemade! This was so easy and not very time consuming. I used on chicken pitas for dinner, dip with baked pita chips for a snack, and sauce on top of greek burgers. I will not buy tzatziki again! Lemon, salt, garlic and lots of oregano! going to make this sauce to dip chicken/veggie kabobs in, any recommendations on the seasonings i should use for the chicken?? Holy moly was this good! I made a Greek feast last night and this made the meal!!! And I stayed well within my points eating something I LOVE! Thanks Gina! OMG!! So good. I just found your website a few days ago and I'm so happy!! I started WW and needed a place like this for recipe ideas that my husband would also love. This was the first recipe I tried and it's fabulous. I put some on my portobello cap "burger" for lunch today and plan on making the Turkey meatballs for dinner. To the Greek who left all your tips, thanks! I've heard some like it with mint instead, I will add a little instead of dill next time and see how I like it. I have so much in my garden. I bought chicken to make the souvlakis this week! I love the sounds of this sauce, and the fact that it is lightened up is great! My boss at work made a really good tzatziki sauce with gyros, but I am sure it wasn't this healthy unfortunately! Gina!! Thanks for the recipe! I've been waiting on it and was going to even ask you to do it up, as I started making my own this spring during my cooking classes. I realized how fattening the regular version is, SO THANK YOU and I can't wait to try it. You can also use print preview on explorer and then just make sure that you print out only the page that has the recipe on it. If not, you get all the advertisements and such. Thank you for this. Sometimes when you're trying to eat healthy it's hard to fit in sauces/condiments and I'm always looking for a way to get the flavor without the fat. For the person who wants to make gyros….my advice is to avoid it totally as it needs fat to taste good….instead buy nice chicken breasts or lean pork meat, cube it, make into gorgeous souvlaki with bits of pepper between peices and just use the same herbs as gyros to make it taste the same. Herbs for chicken are: salt, black pepper, sweet paprika, crushed chicken stock cube, chilly seeds (go easy), lemon juice and olive oil (watch your points!) You can easily add the same to the pork, or go with the classic: salt, pepper, olive oil, oregano and lemon juice! Barbeque or grill skewers turning constantly and they should be ready on about 10-15 minutes. Cook only until meat is pink! As a greek, I make this all the time! So here's a few more tips! Add a splash (1 tsp) of wine vinegar into the mixture to bring out all flavours instead of lemon juice. Mint or spearmint is used in the cyprus and arabic influenced varieties but we, in Northern Greece prefer finely chopped dill. Dill gives it a fresher taste and cleans out the mouth so garlic aftertaste is not as heavy! We definitely don't use a food processor as this makes tzatziki runny. We do all the straining through a muselin cloth, which keeps all the good parts in but you can strain much more juice out of the cucumber and yogurt!We also add 1/2 – 1 tsp of virgin olive oil into mixture as it gives a fab silky flavour to it! Remember that 1 pot (170gr) of fat free FAGE greek yoghurt is 1.7 points, so keep that in mind if your making larger quantities! As another fellow Greek, I was JUST about to post the same exact thing! Do you use red wine vinegar or white wine vinegar? I just printed this and got only 1 page. I use Firefox. If you use Internet Explorer, make sure it's the newest version. I LOOOVE Tzatziki sauce!! Thank you! BUT, when I click the print this post button the recipe always print out on 8 pages & 7 of them are blank? How do you make a Gyros??? I'm sure regular fat free yogurt would work fine. 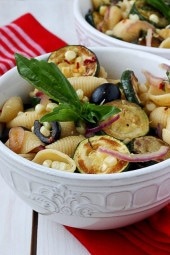 @Duo- I love this with feta, cucumber and tomato salad! @Mo- it's too easy not to make it yourself! Plus store bought is never light. 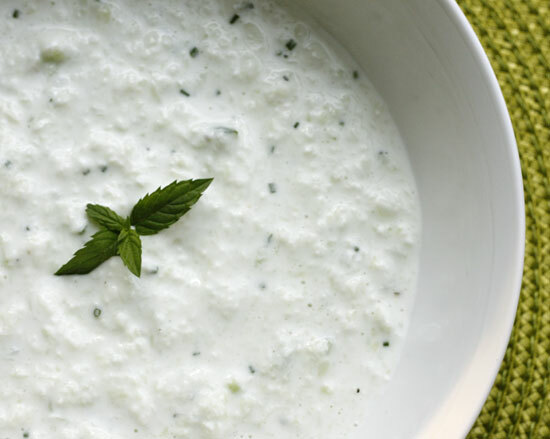 I could drink Tzatziki like soup….that's not gross, right?! haha! i have been searching HIGH AND LOW for a store bought version to no avail. this looks simple enough for me to create at home! cant wait! We've been known to throw feta into our tzatziki. It adds a really nice bite. The dressing is great on its own though, so who needs feta. The lighter, the betta. Do you know if this would be ok made with 8oz fat free yogurt? I don't really care for greek yogurt. Thanks! @Nessa, I'm a lazy chopper! @Julie, I was so happy to see it's 0 points! Oh, I love that stuff! Can't wait to try this one. too funny! i was looking for a recipe yesterday for this same sauce! so glad i am a follower! we will be trying this tonigh! thanks! I can't wait to try this. I just tried this dip for the first time now that I am in Germany and I love it and can't get enough of it! Thanks! OOOOOOO… You have doners in Germany! I got so hooked on them. Cant find anything close in U.S.
Gyros just aren't the same. This looks super yummy! I have made my own version too in the past but what I like is the crunchy aspect of the cucmber so I typically will slice them very thin and cut in cubes. Then soak them in salt water for a few mintutes and drain. No need to dirty the blender! This looks great — I will make it for my homemade gyros! I LOVE tzatziki. I definitely need to try this. Yum. Yes, I made some turkey meatballs yesterday that I will try to post tonight that went perfect with this! do you think this would freeze well? I want to use up all the fresh herbs I bought for this.